Citation: C N Trueman "Boulton Paul Defiant"
The Boulton Paul Defiant’s part in the early stages of World War Two have effectively been overshadowed by the Hurricane and Spitfire. However, the Boulton Paul Defiant was to play an important role in trying to stop the advance of the Germans into Belgium and France in the Spring of 1940. But against the fighter planes of the Luftwaffe it stood little chance once they realised that the plane had an Achilles heel when attacked. The idea of placing the main weaponry of a fighter behind the pilot had first been espoused in 1935 – there were those who were supporters of the ‘power-operated multi-gun turret’. This idea had the advantage of allowing the pilot of the plane to fly the plane and leave the defence of the plane to the person who was in the multi-gun turret. This person also had the task of being the plane’s offensive officer.The Boulton Paul Defiant had its main weaponry in a turret behind the pilot. In 1935, the idea of such a design for a fighter plane was still acceptable, though the armament of the Boulton Paul Defiant was soon to be overtaken by the forward facing weaponry carried by both the Hurricane and Spitfire. The Boulton Paul Defiant first flew in August 1937. Its turret, though it contained awesome weaponry, was also responsible for increasing the drag factor of the plane which had an impact on the plane’s speed. The Boulton Paul Defiant had a significant success in the German attacks leading up to the evacuation atDunkirk. The sheer fire power of the Defiant took the Luftwaffe by surprise and by May 1940, the Defiant had shot down 65 German planes. 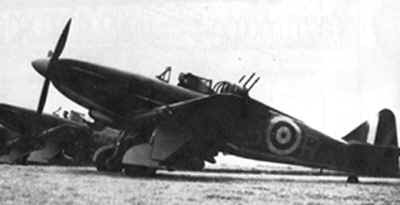 However, the Luftwaffe soon learned that a Defiant attacked head on was an easy target and by August 1940 they were withdrawn from military daylight operations. The Defiant carried on as a night fighter. In the aftermath of the attack on France, the Defiant was fitted with the A1 radar and in the winter of 1940 to 1941, the Defiant recorded more kills than any other night fighter plane. But as a daytime fighter it was simply outclassed and as fighter plane design developed, the Boulton Paul Defiant was simply overtaken. Armament: four x 0.303 machine guns in dorsal turret.